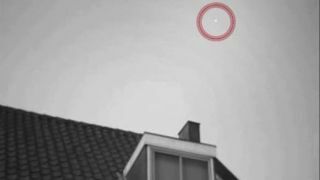 This still from a video by skywatcher Marco Langbroek shows the European Space Agency's space cargo ship ATV-3 as it passed over Leiden in the Netherlands on March 23, 2012. Skywatchers around the world have two more chances to spot a huge robotic cargo ship that is currently orbiting Earth, but time is running out. By Wednesday (March 28), the spacecraft will arrive at the International Space Station, and both spacecraft may be visible together just before docking, weather permitting. The giant space delivery truck is the Automated Transfer Vehicle 3 (ATV-3), a massive unmanned freighter carrying nearly 7 tons of cargo for astronauts on the space station. It launched into orbit last week on a mission for its builder, the European Space Agency. Over the next two days (March 26 and 27), the big cargo ship can be spotted by skywatchers in parts of the world that have clear night skies as the massive spacecraft flies high overhead. Some observers have already snapped photos and video of the ATV-3, which ESA has named "Edoardo Almadi" in honor of a late Italian physicist. "Under the right conditions the ATV-3 can become quite bright," skywatcher Marco Langbroek of Leiden in the Netherlands told SPACE.com in an email. "Visibility strongly depends on the illumination angle … Twilight is the best period to observe it, as it will have a long illuminated trajectory." Langbroek recorded a video of the ATV-3 spacecraft as it sailed over Leiden on Friday, March 23, just hours after it launched from Europe's Guiana Space Center in Kourou, French Guiana. Amateur astronomer Ralf Vandebergh, also of the Netherlands, used a 10-inch reflector telescope equipped with a camera to photograph the ATV-3 Edoardo Amaldi in orbit. His photos show a hulking cylindrical spacecraft with its solar arrays unfurled as it chases the International Space Station. Each website will ask for your zip code or city, and respond with a list of suggested spotting times. Predictions computed a few days ahead of time are usually accurate within a few minutes. Another handy website is this one, which provides real-time satellite tracking and shows you at any given moment during the day or night over what part of the Earth the space station happens to be. Langbroek said it is important to check for updates and to be flexible due to small changes in the ATV-3 spacecraft's orbit. "Over the coming days the spacecraft will maneuver a couple of times, so there can be a discrepancy between predicted and actual times of it passing your location," Langbroek warned. "For example, a prediction made the evening before the morning I shot the video, turned out to be 4 minutes off in time." And there could even be an amazing finale coming up for skywatchers in just the right spot to see both the ATV-3 and space station sail roughly 240 miles (386 kilometers) above Earth one after the other. "In the day or so close to docking on the 28th, there should be a point where you can see both the ATV-3 and the ISS closely together in the sky," Langbroek said. "I watched a similar situation in March 2008 when the first ATV was about to dock to the ISS, and they passed over Leiden just 1.5 hours prior to docking. That was a very spectacular view, these two spacecraft "chasing" each other." The ATV-3 Edoardo Amaldi is due to dock at the space station on Wednesday, March 28, at 6:32 p.m. EDT (2232 GMT). NASA will webcast the space rendezvous live on its NASA TV channel. The European ATV spacecraft are cylindrical spacecraft about 35 feet (10.7 meters) long and 14.7 feet (4.5 meters) wide. They are huge - large enough to fit a double-decker bus inside - but ultimately disposable. At the end of their missions, the spacecraft are commanded to intentionally burn up in Earth's atmosphere. Skywatcher Ralf Vandebergh sent this image of the ATV-3 spacecraft on its way to the International Space Station, taken March 25, 2012. He writes: " ... solar panels visible from a low angle. Obtained using a 10inch reflector and manually tracking." The International Space Station is the largest structure ever built in space and can be easily seen by the unaided eye if you know when and where to look. The space station is so bright that, at times, it can even rival the planet Venus in brightness. Speaking of planets, Venus and Jupiter and the crescent moon are also visible together in the night sky this week. Tonight, they will appear in the west at sunset. The planet Mars is also visible in the eastern sky, and can be identified by its reddish-orange color. If you snap amazing views of the ATV-3, International Space Station, planets or other sky objects and would like to share them with SPACE.com for a possible story or image gallery, contact managing editor Tariq Malik at: tmalik@space.com.